Our first stop on this mission was Banneux, a small village close to Liège, which was an hour and a half from Brussels. 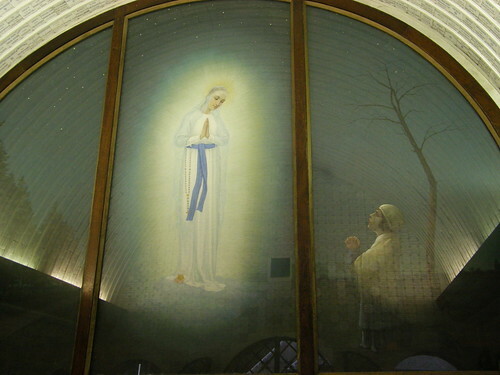 This village became known after the Marian apparitions had occurred there. Our Lady appeared to the eleven-year-old Mariette as “the Virgin of the Poor”, asking for prayers and care for the poor and the sick. 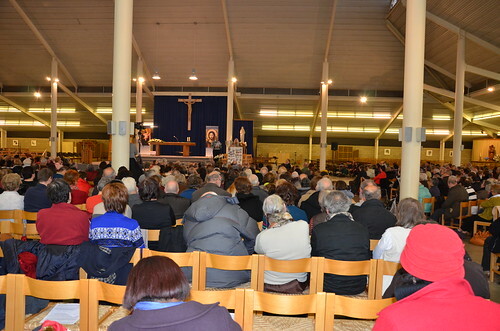 Following the spiritual retreat that had taken place a few days before in Fatima, a place where Marian apparitions have taken place since 1917, Vassula was invited here in Banneux to speak about TLIG. 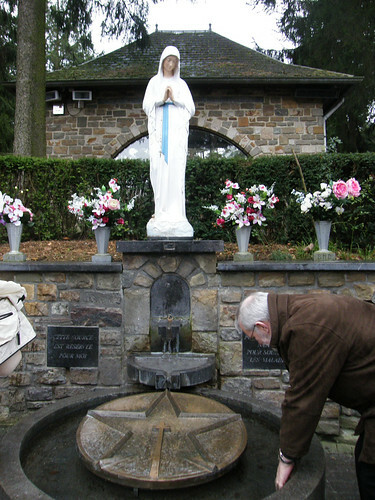 As stated, this village was yet another place of Marian apparitions in the twentieth century, 1933 to be precise. It is definitely no simple coincidence that we were here, since we know that for God’s will, nothing happens by chance…. A common point between the messages given by Our Lady to the three children of Fatima and the messages of True Life in God is the reference to Russia. From the 1917 messages onwards, Our Lady warns about the First World War: the impending danger of communism in Russia and its enforcement in many European countries. In TLIG, the Lord makes several references to Fatima and prophesies that Russia is the country that will glorify Him most and act as the spiritual leader of many nations. 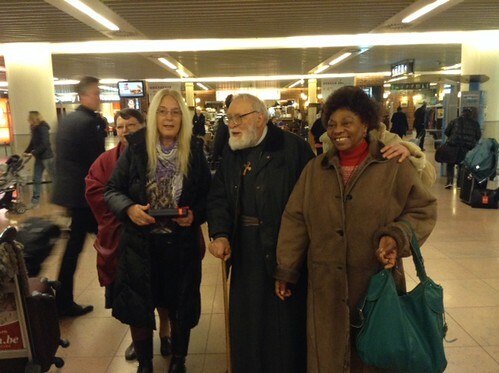 On the evening of Friday, January 31, at the Brussels airport, we were welcomed by father Theophilus and his wife, along with Charles, Claudine and Rose, Annette with her two little children and a few more TLIG friends from Belgium. After that, we departed for Banneux in a private car. 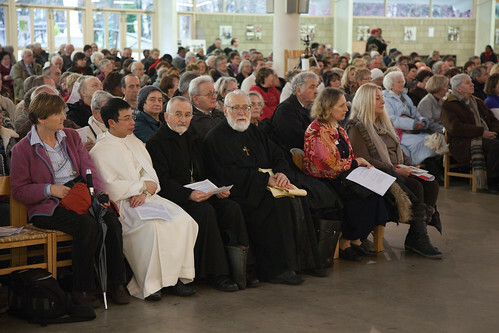 The man who invited Vassula to Banneux was Deacon Benoît Wey, who enlisted the help of his friend Charles Dehareng to organize the address. Charles’s assistance with practical matters of organization was invaluable indeed. F. Theophilus and some of the meeting organizers welcoming Vassula at the airport. At the hotel, we were expected and welcomed by the other organizers of Vassula’s address. Attending from Belgium were Magdalene, Dominique and Brigitte. From France, Bertrand Vallancien, Robert Lepicard and many others had come to provide French readers with books. After greeting Vassula with love and embraces, they escorted us to our rooms. It was already well past 11.00 p.m. 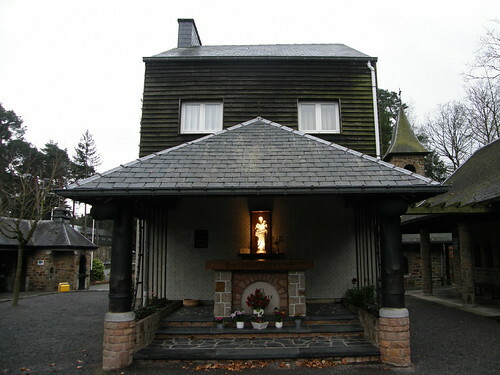 The small chapel, built at the instruction of Our Lady in Her honor. The following morning Vassula had a private meeting with the priest at the Shrine of Our Lady of Banneux, f. Leo Palm, a pleasant man with a special sense of humor. During this meeting, we took a tour of the shrine with Dominique, with the intention of exploring the area. A unique tranquility and joy was pervasive. After going through small chapels and little Mariette’s home, we reached the spring that Our Lady had wished to be built in her honor. We dipped our hands in it and we pleaded with Her for the success of Vassula’s address at this blessed place and for ill friends and acquaintances. This is the house where Mariette lived with her family. 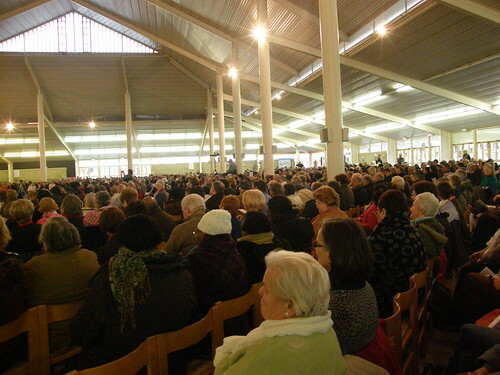 At 11.00 a.m. we attended Holy Mass at the big church, adjacent to the shrine, with a capacity of 3,000 people. 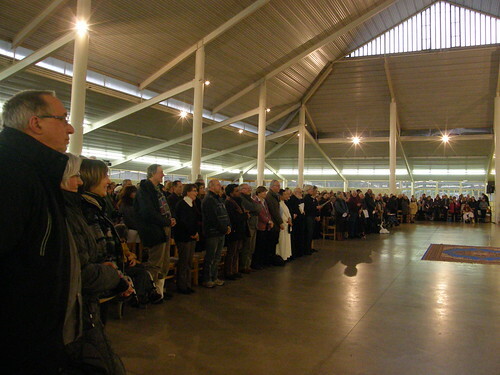 It was celebrated by the parish priest of Banneux, f. Leo Palm, and other priests. Right after that, Vassula gave two interviews. 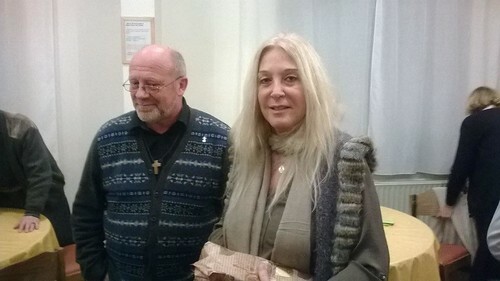 The first one was with André Charton, for thejournals Stella Maris, -Sourire de Maris and - Chrétiens Magazine.The second interview one was given by Carine Vantomme and J. Mampaey for the journal “Tijdschrift van de Rozekrans” (Journal for the Rosary), a well-known Dutch journal distributed in Flanders. 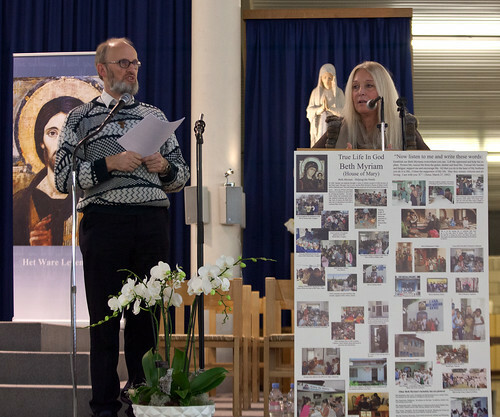 Vassula’s address began at two o’ clock in the afternoon, at the same church. 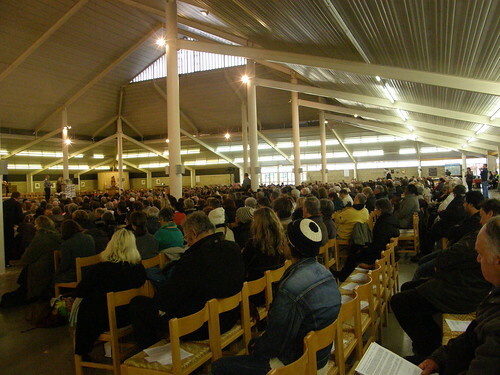 By two o’clock about 2,500 people had already assembled. Dominique introduced Vassula and invited her to speak. 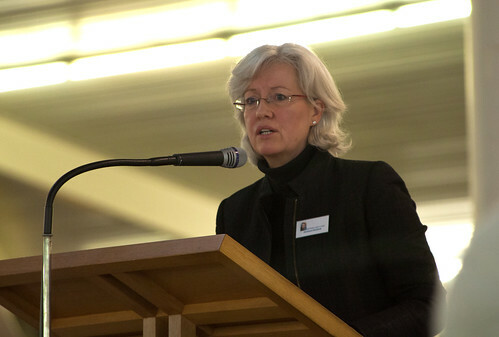 Her address was delivered in French, simultaneously translated by Francois Eliat into Dutch. Realize the urgency of My Call and the importance of My request. I need your heart to unite you and rebuild My Church united into one, inside your heart. All I ask is love to break the barriers of your division”. Upon concluding her address, she asked us to pray for the Church leaders, so that the members of the mystical Body of Christ can assemble. Pray that with help from the Holy Spirit they can discern the signs of the times, inviting us to unity around one altar. This way, together, we can declare with one voice that there is one Lord, one faith, one baptism and one God and Father of all, above all, through all and within all. That will be the triumph of Jesus Christ. 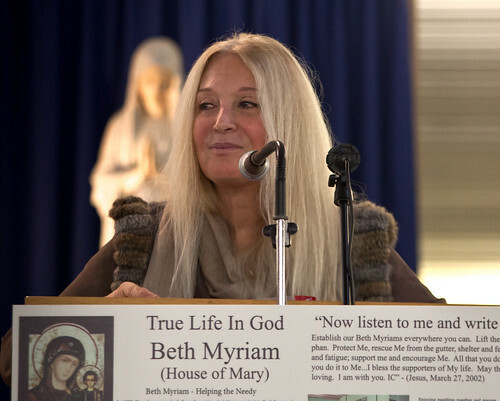 This was a very impressive address about the messages she receives from our Lord and our Lady. 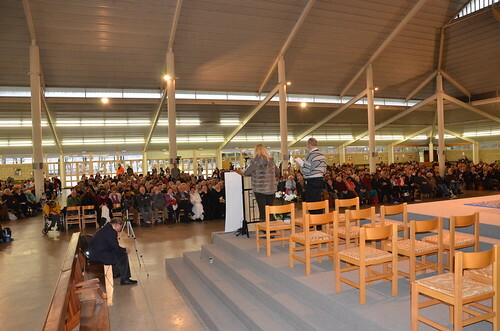 Every time she speaks, it is through the same power granted her by the Holy Spirit… For this reason, the people attending her talks have been moved to tears many times. 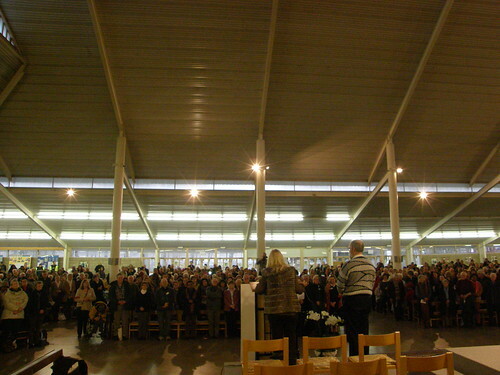 After a short break, it was time for the healing service. Holding the Cross, Vassula read the Prayer of Repentance and Deliverance given to her by Jesus Christ for our times on November 13, 2006. Behind the seats, there were stalls with all the TLIG books in Dutch and French, as well as the new book containing all the messages from 1986 to 2003, which sold out. There were also many copies of Vassula’s paintings and, of course, free informative material. Many books were sold in Dutch as well as in French. For people already acquainted with the messages, this address was a great renewal. 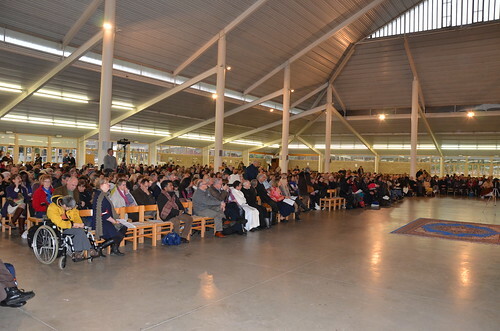 Those who were hearing about the messages for the first time were deeply touched in their heart. 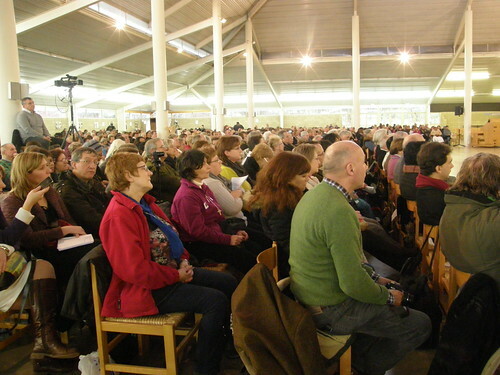 The responses from people, Magdalene said, as they were leaving church and at the book stalls, were sincerely coming from from their hearts. It was indeed a beautiful, bright day in Banneux, even though it was rainy…. 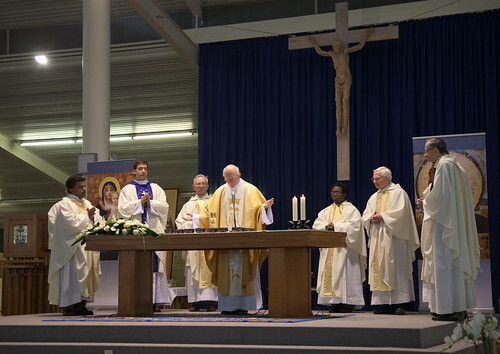 At dinner, all the priests and organizers were invited. 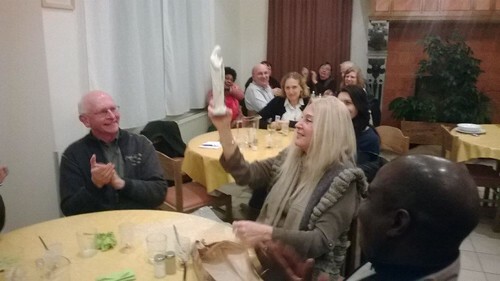 Madeleine, on behalf of the organizers, offered Vassula a small statue of “Our Lady of the Poor”, as a gift of love and gratitude for her witnessing at Banneux. The atmosphere was extremely happy, since Vassula’s mission had been accomplished with great success. Vassula is displaying the gift given her by the organizers at Banneux. 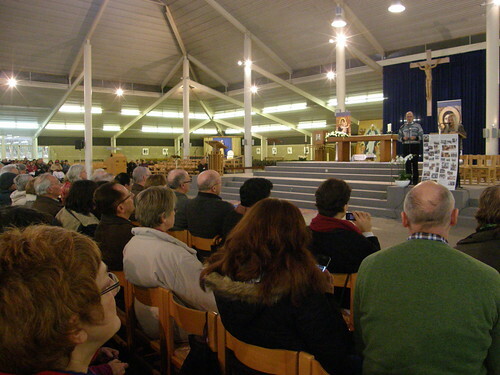 We thanked our dear friends from Belgium and France for the wonderful organization, their zeal and love for Jesus and Our Lady, and the following day, early in the morning, we departed for our next station, the Netherlands.